Each year, once the sun finally decides to make an appearance, I make a reservation at the Ferryland Lighthouse Picnics. 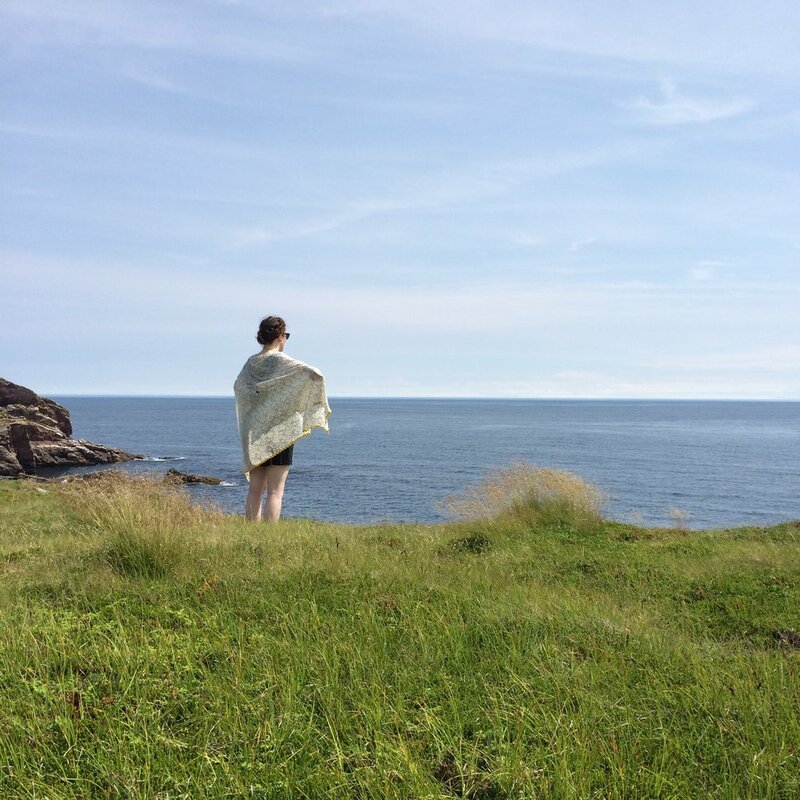 Since its opening 14 summers ago, the Lighthouse Picnic has been creating amazing memories for its customers and bringing great attention to the beautiful and unique details in Newfoundland and Ferryland itself. It has been a tradition in my family for a number of years to visit the Lighthouse Picnic for a scenic day trip and of course, a delicious lunch. It has been one of my greatest pleasures to extend this tradition past my immediate family and introduce it to a few of my greatest friends. There is something truly special in bringing a friend to experience something that you have had such a deep love and enjoyment for. Naturally, every person that I have introduced to the Lighthouse Picnic, has understood my attachment and have fallen in love with it themselves. As you arrive, you'll enter the parking lot of The Colony of Avalon site which is a fascinating collection of remains and archeological sites of one of the earliest European colonies in North America. 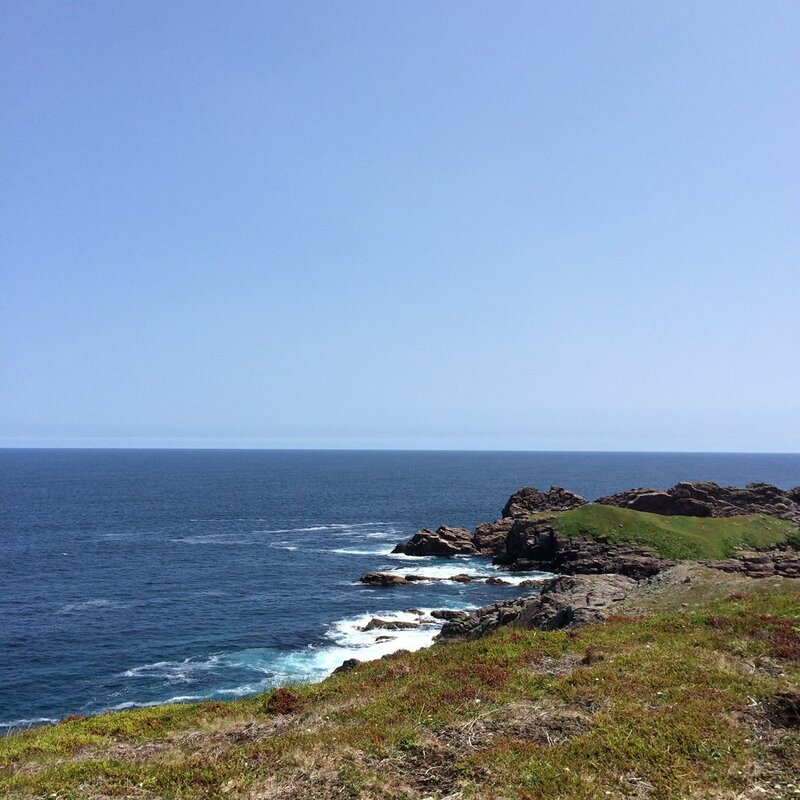 Here, you have the option to park and walk the approximately 30 minute walk to the Lighthouse, or continue driving up a cliff-side dirt road to an overflow parking area and reduce the walk to about 10 minutes. Along the walk you will find information posts about The Colony of Avalon as well as the Lighthouse Picnics, on top of lots of little areas worth exploring, if you have the time. This dirt path will take you through the forest and finally, to a clearing displaying a perfect view of the red and white Lighthouse. Immediately you will be in awe of the relaxed nature of everyone as they take-in the jaw-dropping natural landscape and seemingly effortless beauty of this place. Whether it's a hot and sunny day or a chilly one with fog, the view is breathtaking. Once you have taken in the once-in-a-lifetime views, it's time to step inside the Lighthouse. Built in the 1870's, the Lighthouse maintains its authentic design with modern updates involving the installation of a restaurant kitchen and modern necessities. The interior is filled with warm, cozy wood and the scent of fresh, delicious food. In the building they sell a multitude of items based on Newfoundland culture, including the ever-necessary wool socks. Here, you will place your order with staff, gather a blanket (one is good for 2-3 people) and you will be given a coloured flag that will be assigned to your specific order. The menu at the Lighthouse Picnics has been consistent for quite a number of years with only a few additions and new dessert options. But, in this case, this is not a bad thing - because they absolutely nailed the menu the first time. It's perfect! Every visit, I order the same two things. I spend all year dreaming about these visits and can't imagine visiting the Lighthouse without getting to try all of my favourites! So, be prepared, if you ever dine with me: I make you go halfsies with me. It's the best way to taste multiple things! My must-haves are the Curried Chicken Picnic and the Ham & Brie Picnic. Each order comes with a Lighthouse Salad, the sandwich, a dessert of your choice and Fresh Lemonade. Don't worry, I'll elaborate on these shortly! Now is when the real fun begins! Once you have your order placed and your flag and blanket in hand, it's time for an adventure. You have two choices. You may choose to situate yourselves close by to the Lighthouse for easy delivery, or wait for your food and then make the pilgrimage cliff side for the best views. Personally, I like to remain close to the Lighthouse. Not simply because I love delivery, but because once you have finished your meal you can easily return the basket and then head out for a walking adventure. With your lunch location chosen and situated, you have to do nothing but enjoy the company of your loved ones and the stunning views. Don't fret if the weather isn't on your side, there is seating on the inside of the Lighthouse as well! Last year Lauren and I visited and it rained heavily the entire time. At first, I was devastated. That was until we were cozily nestled away in the bottom floor of the Lighthouse, drinking tea and chatting with others hiding from the rain. Whatever the weather and wherever you decide to rest, the wonderful staff of the Lighthouse Picnics will track you down and personally deliver you an outstanding meal. It is worth mentioning at this point that the entire staff of this business is absolutely fantastic to deal with! All the way from emailing about reservations with Jill to the individual taking my empty basket at the end of the visit, they are all amazing people with a true talent for creating a beautiful atmosphere. Thank you, to all of you! You have created a fantastic experience for me and my loved ones, year after year. Your meal is delivered to your little piece of land, cliff-side, all cozy on your plaid blanket. The presentation is simple and rustic - the perfect look and feel for such an authentic and unique experience. As mentioned previously, each meal starts with the Lighthouse Salad. 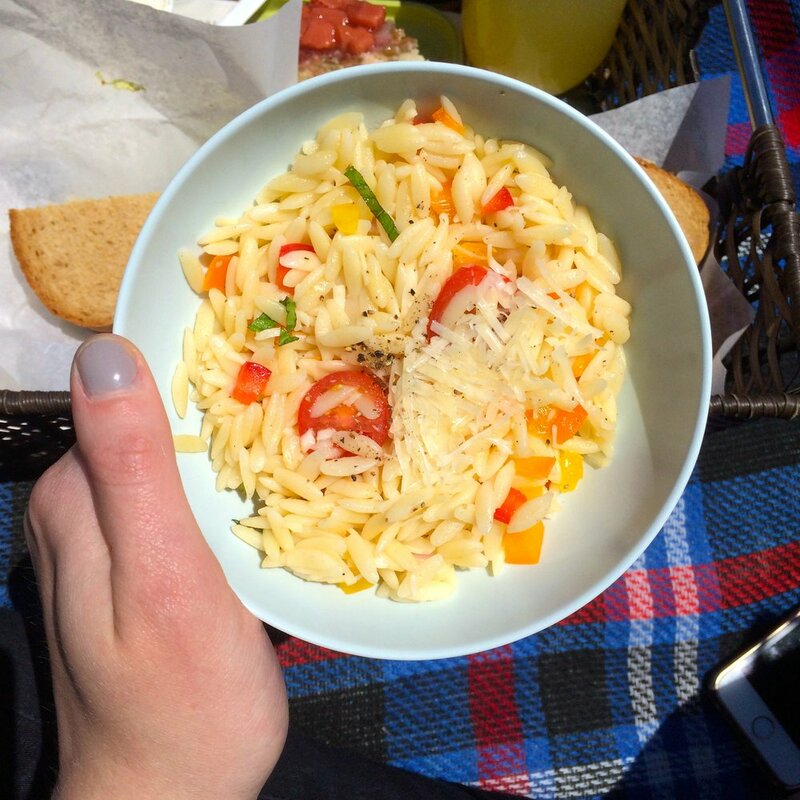 This is an orzo-based salad with red onion, peppers, herbs, red wine vinegar, tomatoes and parmesan cheese. This salad is light with delicate and fresh flavours. I love this salad! I have a hard time deciding my favourite sandwich - it is a very close tie between the Ham & Brie Sandwich and the Curried Chicken Sandwich. The Ham & Brie Sandwich features a Chutney-glazed Ham, Brie, and Green Apple served on homemade Oatmeal Bread. The flavours of this sandwich are complex and rich. This is truly the definition of what would be a gourmet sandwich. The Curried Chicken Sandwich features Chicken Breast with Celery, Green Onion and sliced Almonds in a Curry Dressing, also served on Oatmeal Bread. Being a fan of curry, I was immediately drawn to this sandwich and it totally holds up to all expectations! It's hearty, rich and absolutely delectable. I could eat this everyday! The dessert menu at the Lighthouse Picnic is relatively consistent with a few added additions each year. I have tried many of these but have found one that I am completely stuck on! The Coconut Cream-cheese Muffin. Other options include: Warm Gingerbread & Custard Sauce, Orange Crumble Square, Strawberry Upside Down Cake, Peach Shortcakes, Cranberry Scones, Chocolate Cake - and many of others! I could rave about the Lighthouse Picnic food forever. But, arguably, the Fresh Lemonade is the true star of the show. Served in a mason jar, this thirst-quenching, just-sweet-enough, delicious beverage is something I think about year-long! If they bottled it, I would buy it. If you have yet to visit the Lighthouse Picnic, I highly recommend you make the plan to head out that way - of course, they are booking up quickly so you'll want to make a reservation! You can find their website here and their Facebook here. Wear sunscreen - you're going to want to lay about or adventure in the sun, trust me! Bring binoculars - you'll probably see whales, or at least some foxes! Bring a camera - the view needs to be shared! Don't wander too far for the staff - you don't want to delay getting your food - obviously..
Also, a handy thing to note is that the Lighthouse Picnic also does gift cards - which happens to be one of Lauren's go-to gift ideas for summer weddings and engagements. If you have already been, I hope this post felt all-encompassing in the fantastic experience I know all of us have shared at this location. It truly is one of a kind!